A recent trip to America proved to be a traumatic period for Traffic. Once again the line-up has changed, with Jim Gordon (drums) staying over there to return to session work and Rick Grech leaving the band under undetermined circumstances, on his return to this country. 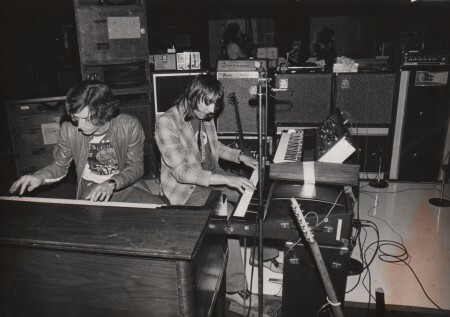 The two have been replaced by two session men from Alabama's Muscle Shoals studios - Roger Hawkins and David Hood. Down on his Sussex farm last week, Rick Grech talked abut the position at the moment. He was obviously disappointed at the way he finished with Traffic, and carefully considered what he had to say, frequently pausing for long periods between and midway through sentences. He is re-thinking his career, a stage he has been through several times since leaving Family. He has plans for an album, and another roadband - though he dispels the rumor that he and Jim Gordon could join up with Dave Mason. At the farm evidence of an all-night session was still present: on one side of the room a piano, on the other drums, and in between numerous bass, acoustic and electric guitars. Almost like a country squire, with his three dogs around him, he talked logically and without bitterness about the effects playing in Traffic had on him. Stewart: When did you leave Traffic? Grech: When I read it in the paper .. that was it more or less. Up to then we were aware that things would be changing; I mean we hadn't seen each other or anything, and in fact, nobody had spoken about it. And then you rang me that day - that day before the papers came out - I mean I hadn't heard anything previous to that. It was a surprise to me in one way. What happened to the band for the split to come about? Well, I guess it was just differences in musical taste. With Traffic things are never really verbally explored, or taken apart. Everybody just gets together and does the thing, and even then we never really talk about it. I've seen Steve (Winwood) and Chris (Wood) a few times .. I mean Steve was here New Year's Eve, but we still didn't talk about it. I think we just take things as they happen and go along with it. There's usually a sort of reason. Things change, and if you went about trying to change things back you'd end up somewhere else. And things have always happened that way ever since I can remember. Was that the way the band always worked? I've noticed on your gigs that you all seemed remote from each other - just playing together and then drifted off. Yeah, it is a bit that way. But I think this whole thing that happened just now was more to do with the management. The group didn't really want to do it, but they were forced contractually to do that. Initially the tour (of the States) was based on a two part thing. We were going to do the first leg, have a little break, and then go back. But by the end of the first one things started to get a bit rocky, so we decided to leave it for a bit. But then, I guess, they decided they had to go and do it. So it was really decided by someone outside Traffic? What do you think their reason for doing it was? Because musically the band wasn't as solid or as together as it usually was, and Traffic basically is Steve, Chris, and Jim (Capaldi). You know I came in two years ago in the rhythm section on bass, which was all right for the first year, and then things started to get .... well, they experimented with a bigger group and I don't think it reached the same sort of thing. I don't think it was quite as good as it was. So naturally I think Steve must have decided ... well, I knew the changes were going to happen and he needed to think about what he was going to do and what sort of thing he was going to get together. Was it a disappointment for you to leave them? Yes, it was, because for me being in a group is like .... the main thing is how you feel towards the other people in a band, your association with them and your feeling towards them, and also their musical output. As a musician, I always find creativity comes better for me if I've got like a strong force to play up to. It's a challenge, right? So I always like to play with people that I really admire musically. Traffic's policy, at one point, seemed to be to go over ground already covered, and because of the looseness it restricted the development, which could have been faster and better. Did you find this in the band, and was it dissatisfying in some ways? It was, because I kept saying we were going over old ground, with just a few different instruments in the band. Like you said, the development could have been even more so. I think it was restricting in one way to have this bigger thing (referring to the line-up). From that point do you think you have have developed faster? At one point you said you should like to introduce the violin more, but that never really came about. No, not in that sense. Mainly ... like one of the reasons is that you have to fit the right instrument with the right numbers. You can's just stick a violin on one number because you feel like playing it. And in the other sense, if I played violin someone would have to play bass, or Steve revert to bass pedals, which is going back to the problem Traffic had before they asked me to join to play bass. Is there any significance in the fact both you and Jim Gordon left at the same time? Well, Jim didn't come back from America. Then, it was just out in the open, you could say .... it was just a matter of getting together, talking about it and seeing what happened. I mean, I was aware that maybe Jim wouldn't come back. Well, the thing is I didn't really know what was going to happen until it happened. But, I guess, maybe subjectively things happen because you want them to happen, even though you don't really think about it. Because the members didn't communicate, aside from the music, when there must have been some rapport going, do you think it had a detrimental effect on the band? Yeah. I think communication is a very important thing, but I think we used to communicate through the instruments more than anything else, and things used to sort themselves out through that. So it's all down to the music. Why do you think they've brought in the two Muscle Shoals guys? I don't really know. That was a strange sort of thing, because, well, I don't think I could sort of personally pick two session men out, especially as part of such an integral thing as the rhythm section. And especially because they hadn't played live before? Right, that's one reason. I mean there's no doubt that the musicians involved won't have any trouble in getting together. They'll probably be able to get the whole thing together in a day. But then again, it's not just a case of playing the notes. Yes, that was one of the things I noticed when Jim Gordon took over on drums; he's a competent musician and I wouldn't put him down in any way, but he didn't have the same feel as Capaldi did. Oh well, that's natural. Nobody plays the same as anyone else, unless he's consciously copying him. I can see why Steve wanted Jim Gordon to join, because he is a competent drummer, and he just laid down what was needed. But then there's more to it than that. With a lot of traffic music, each instrument had to be able to say a certain thing. Again, its' subjective4 in not being aware of the thing, but if it happens the other musicians became aware of it, and naturally because you start thinking about what's going on, you don't feel it's right, so you can't put out your full output ... you start thinking about what's going on and then, naturally, it becomes a little bit disjointed. And then what happens? you think again because .... it's pointless playing in a band if you go out every night and you come off stage feeling totally dissatisfied with the whole thing. With Traffic there were nights when it was really good, but then I think there were more nights when it wasn't. From speaking to Steve, do you think Traffic will still go on in some form or other? I should think so, because whatever happens, Traffic is always centered around Steve, he's the musical policy and the people who play with him express their own individual things, but are aware of basically what he wants. Steve doesn't lay down ... doesn't say "right, this is how it should be played". He suggests an idea and the people develop around that - which is great because it foes give people the chance to express their own individual thing. So, if it's going to be like that, Traffic will always go on, or else it's going to be the Steve Winwood Band or something. Since leaving Family you have been through various musical experimentation stages with Blind Faith and Airforce. Then Traffic seemed to steady you a great deal. It did. It really sort of got me together, which really dig. What are you future plans now? Well, I haven't really sat down an thought about what I'm going to do. I never have done anyway. But I'm getting the urge to start writing again, now that I know I don't have to go on the road. I was told today that you were up all night working. Are you doing anything besides writing? Yeah, I'm just getting ideas down (rough tapes) that I'd like to put out on an album pretty soon. No, not a solo album in that sense. Just an album made with people that I know who would like to do something similar. Instead of asking all different people to come and play on different sections I'd just like to get four guys together, and just work as a band more or less - again with everybody putting in their own thing. But it's good to have a bit more control over things, in lots of ways. Did you find that the lack of control in Traffic regarding musical policy was retrogressive to your own development? Not really, because whatever we were playing, he music was still up to a good standard; it wasn't just a case of going on there and playing, and thinking let's get this one over. In Traffic people go on the stage and really put everything into it. I mean, it used to get to a very emotional stage, because as a musician, if you don't express yourself you find it frustrating. You've mentioned doing an album with some friends - a sort of group. Have you any plans to go on the road? Say a group of us do get it to the point where we've got enough material and do do an album, then there's no reason why we shouldn't go on the road, because that's what a group's for actually. Have you any ideas of who you would like to work with? Do you think things are shaping up for you then? Yeah, I think they are, and I'm looking forward to what the outcome will be. I think nowadays musicians are more aware of the fact that in music individuality and originality are things that you must try to put out.